Fun Knowledge My Chronicles Happy Chinese "MOoooOO" Year From Tekkaus! Happy Chinese "MOoooOO" Year From Tekkaus! 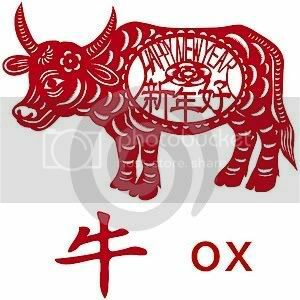 The year of Ox is here finally! I'm sure most of you (if not all), are in holy, jolly good mood right? How was your reunion dinner on new year eve? Did you had a hearty meal with your family? A bowl of shark fins? A platter of yummy-licious abalone? The tube has also served us with a few Chinese New Year ads right? Some are deliciously touching, while others are downright meaningless. Moreover we could hear Chinese New Year tunes blaring in the shopping complexes, shop lots and houses right? Hey, we are enveloped by the sheer atmosphere of this festival! Yeah, my wife is a little timid. Undeniably Chinese New Year is the most significant festival to Chinese in Malaysia. It is also dubbed as Lunar New Year and it lasts for 15 days with a myriad of exciting events to offer. This date is determined by the Lunar calender and normally falls somewhere in January or February. Preparation usually starts months ahead. But this year, we only started to "clean up" days before Chinese New Year. I must say we did a great job! So here's a little something about Chinese New Year! 15 Days of Non-stop FUN! Every household will be busy spring cleaning their "lairs" before Chinese New Year! To the Chinese this is vital, spring cleaning is essential because we believe it can help us sweep away any bad luck accumulated in the past year and have the house ready to receive new luck for the year as the the day arrives. We'll have lots of "Fu"-Blessing! 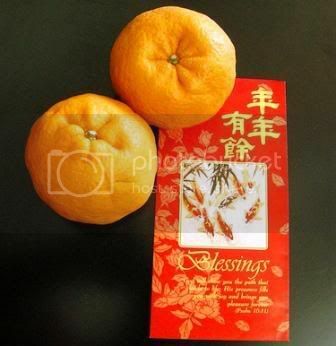 Besides that a common decoration in Chinese homes is red papercuts (Ang Pow) on walls, windows, potted plants of small oranges (which symbolises 'Blessing') and flower (Spring). You might see inverted Fu ('Blessing') on the main door and living room to symbolise "Blessing has come from heaven into my house". My late mom will always stock up the refrigerator as part of the preparation for Chinese New Year. Mom said this symbolizes we are prosperous and have lots of food to put on the table. Other preparation involves stocking up new year goodies like nuts, sweets, tarts, cookies (My house is full of it), preserved dried fruit! And where would people hunt for these bargains? Supermarkets of course. Yeah! These places are exceptionally busy before Chinese New Year. You could see flocks of bargain hunters shoving around the supers. This totally doesn't indicate any slowdown in our economy right? On the new year eve itself many wet markets will be opened through the night until early morning. The place to be at if you want to soak up the new year atmosphere will be Chinatown where throngs of people will be doing their last-minute shopping spree. As I mentioned earlier, Chinese New Year's Eve is one very important tradition as families will gather and spend the evening together having a sumptuous meal aka Reunion Dinner. Perhaps it is because family members from different part of the country and world come back and have dinner together. That's why! We will also toss raw fish called Yee Sang to usher in blessings for the new year eve! The must have Yee Sang for reunion dinner. Once the clock strike 12, we will proceed with the praying ceremony. We will offer our prayers to the Gods. Then the children will usually stay up from midnight until the next day as it is believed that this could increase our parents' longevity. On the 1st day of Chinese New Year...early in the morning...children and grandchildren will kneel and wish their parents (at least my family does this). This shows our filial piety and our obedience towards our parents. Yupe! Don't forget the Mandarin Oranges ok! Visitation to relatives and friends are mostly done during the first two days of Chinese New Year. Okay here's something I just found out: when visiting, it is a common practice for each family to bring along 2 Mandarin oranges as symbol of good luck to the family whom they are visiting. In return the host will swap the oranges with theirs to reciprocate good luck to the visitors. -A~ha, here's the part that everyone loves, EXCEPT parents of course. 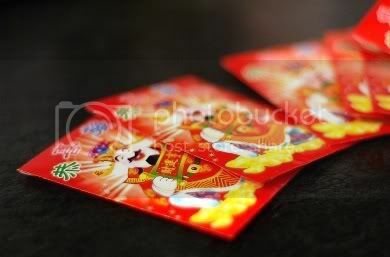 For the married, they need to give red packet (containing money of even sum like RM2, RM4 etc.) to the children with words of blessing when the red packets are handed out. -People are not supposed to sweep the floor on the first few days of new year so as not to sweep the good luck away. -On the 7th Day of New Year is "Ren" day which means it is "every body's birthday" as they are considered one year older from the date. 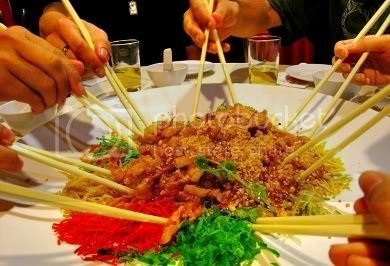 Usually noodles are eaten to promote longevity and raw fish Yee Sang for success. -On the 8th day the Hokkien have ANOTHER family reunion dinner and at midnight they will pray Tian Gong or the God of Heaven. -Usually there are numerous lion dances, fireworks, firecrackers and other new year activities going on throughout the first 2 weeks of the new year. Yeah! You must have seen all the fireworks huh! -Tong Chiang! Tong Chiang! Lion dance troops are invited by businesses to perform lion dance at their shops or business premises to ward of evil and bad luck and usher in a prosperous new beginning. Of course people will invite the lion dance for performance back in their home too. -Of course we cannot do without gambling! Actually we are honing our mathematics. From mahjong to poker, to 21 etc. You name it, we play it. 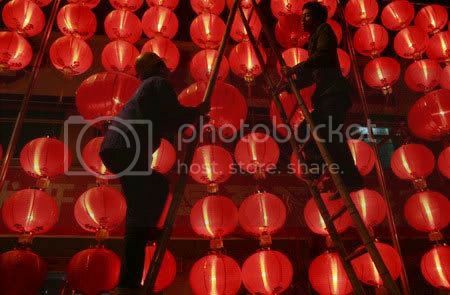 -Then comes the "curtains"-"Chap Goh Meh" which falls on the 15th of the first month of the Lunar Year, which marks the end of Chinese New Year! JL-->Yeah! Congratulation! You are the 1st one. Haha =) Thanks. Yeah besides busy, I couldn't really post anything because the streamyx here is so darn slow! =/ Happy Chinese New Year to you too. Ah happy new year, it's quite a hectic week. On the 1st day of CNY, my true love gave to me a roast duck in a pear tree...LOL! Yeah, I wanted to write it that way too. Ha =) Anyway thanks for dropping by bro. Wish you a Happy & Oxpicious year ahead! Ang pao - evennumbers meh? I give odd number. When I was small, the minimum was $1.10...but now RM1.10, can't even go breakfast and have a bowl of noodles. My minimum is RM5...but 500 sen is considered even number, right? LOL!!! 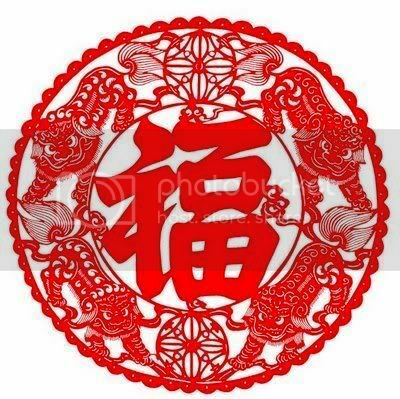 Gong Xi Fa Cai Xin Nien Kuai Le to you and you family! P.S. Pretty quiet here, not like before. Economic recession, all feeling the pinch. Haha =) That's what I heard lar. Yeah, same here. Lion dances is not that frequent anymore. But well...we still have to enjoy it. It only comes once in a year. huwa! i have been craving for yee sang! :( if you read my previous post, you sure know about it. happy chinese new year tekkaus... even tho i heard "earth ox" is not a good year hehe. it's been a hectic week for me. the whole week was filled with lotsa angpows distribution, visiting and eating. hope u have a fabulous time this year. Faisal Admar-->Yeah! Read about it. Haha, then why don't you get urself a plate of the yummy yee sang? Yeah, earth ox don't seem to be a good year huh! =/ Anyway thanks for the wishes. ox year come after the cow milk poison scandal. just nice timing ya. Ron Jerem Lee-->Haha! =) Perhaps it's not such a good year huh! i am not sure how 2009 will be for me. i hope i will also have a successful 2009. i have not yet checked my horoscope but i will surely do it. you have a pretty blog... impressive. keep it up. can we please exchange links? please? 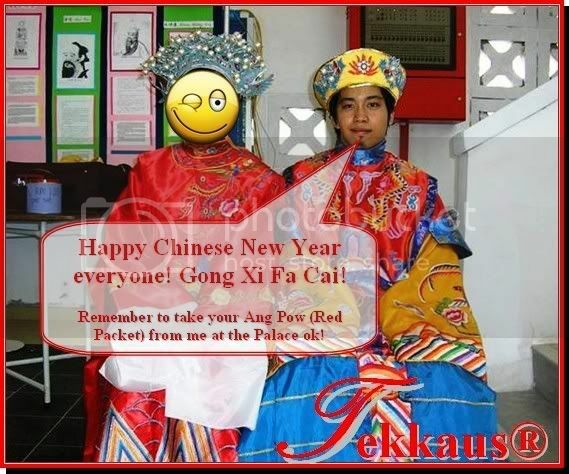 Hello Emperor Tekkuas and smilling Emperess, Wishing you happy 'Ren' today and always! This is 7th day of CNY. Happy birthday to all! Eastcoastlife-->Yupe! It's everyone's birthday today. =) Where's my present? Levian-->Bonding is what we bloggers do for a living? Hey, that's new. Thanks for sharing.